!isa<type>(expr) - Dynamically determine the type of an expression. Definition at line 1035 of file Record.h. Definition at line 1048 of file Record.h. Definition at line 1357 of file Record.cpp. Definition at line 1338 of file Record.cpp. 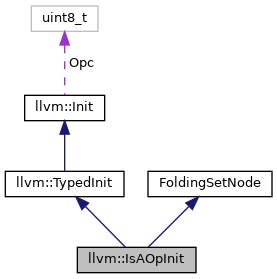 References Allocator, llvm::FoldingSetImpl< T >::FindNodeOrInsertPos(), I, llvm::FoldingSetImpl< T >::InsertNode(), and ProfileIsAOpInit(). Convert this value to a string form. Definition at line 1388 of file Record.cpp. 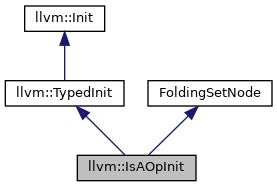 This method is used to return the initializer for the specified bit. Definition at line 1384 of file Record.cpp. This virtual method should be overridden by values that may not be completely specified yet. Definition at line 1058 of file Record.h. Definition at line 1353 of file Record.cpp. This method is used by classes that refer to other variables which may not be defined at the time the expression is formed. If a value is set for the variable later, this method will be called on users of the value to allow the value to propagate out. Definition at line 1377 of file Record.cpp.